Trolley mounting or free standing. Integral handles for easy lifting and portability. Non compartmentalised for greater flexibility. 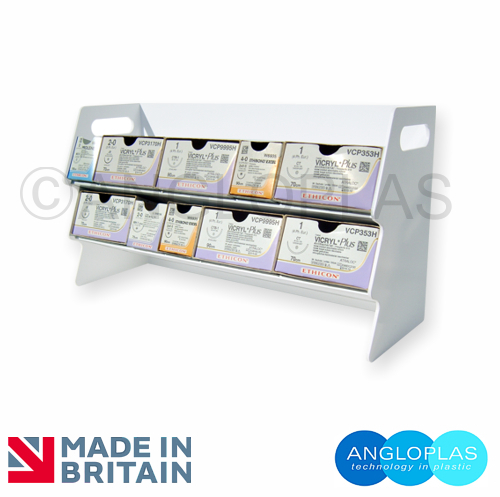 Unit contains 2 x shelves; 730mm wide x 70mm high. Suits Ethicon™ brand sutures or similar. Quick and convenient access, while keeping work surfaces clear. Extremely hygienic and easy to clean compared to wire rack types. Manufactured in Easy Clean, Bright White Rigid PVC. Please note that this is NOT an antimicrobial protected product. *Prices EXCLUDE packing, delivery & VAT. These will be applied during the checkout process. To check the applicable packing and delivery cost for this item please click this link.